You can use the Restore application item option to explore backups created by Veeam Backup & Replication. For more information, see the Application Items Restore section of the Veeam Backup & Replication User Guide. You can go to Start and click Veeam Explorer for Microsoft SQL Server to launch the application as a standalone console. Then, add Microsoft SQL databases manually, as described in the Adding Standalone Microsoft SQL Databases section. 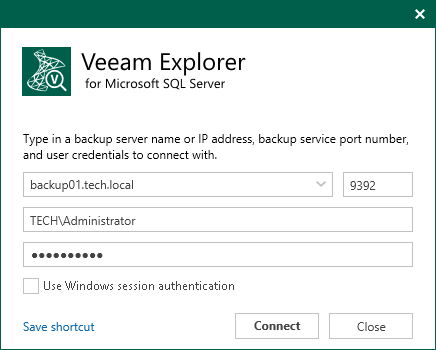 Specify the name or IP-address of a Veeam Backup & Replication server to which you want to connect.